The following blog post introduces a new lateral movement technique that combines the power of DCOM and HTA. 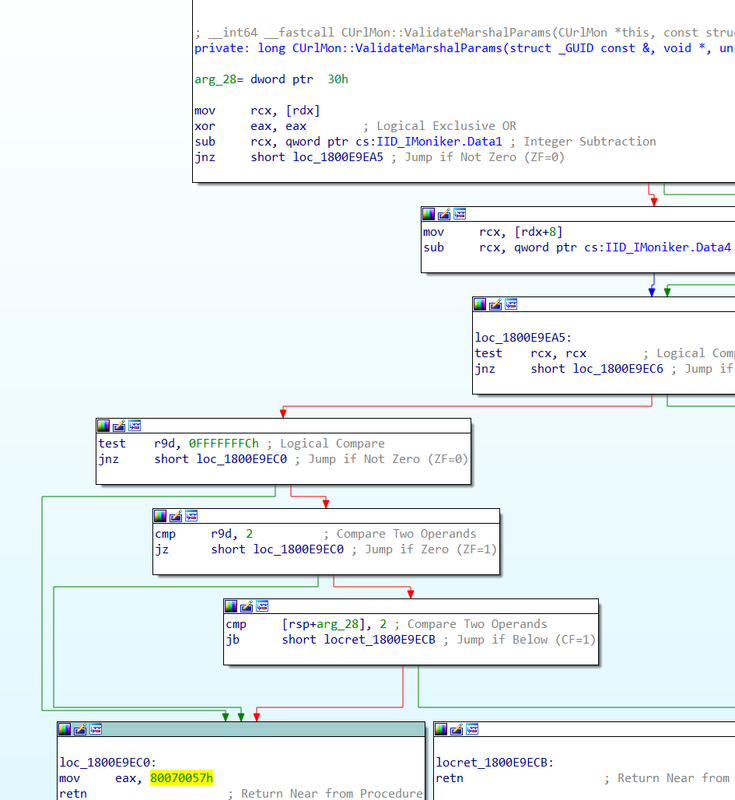 The research on this technique is partly an outcome of our recent research efforts on COM Marshalling: Marshalling to SYSTEM - An analysis of CVE-2018-0824. Several lateral movement techniques using DCOM were discovered in the past by Matt Nelson, Ryan Hanson, Philip Tsukerman and @bohops. A good overview of all the known techniques can be found in the blog post by Philip Tsukerman. Most of the existing techniques execute commands via ShellExecute(Ex). Some COM objects provided by Microsoft Office allow you to execute script code (e.g VBScript) which makes detection and forensics even harder. Using James Forshaw's OleViewDotNet we get some details on the COM object. The COM object runs as local server. It has an App ID and default launch and access permissions. 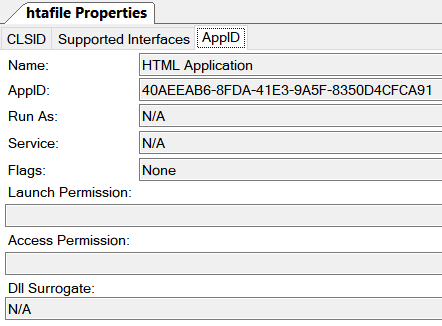 Only COM objects having an App ID can be used for lateral movement. It also implements various interfaces as we can see from OleViewDotNet. One of the interfaces is IPersistMoniker. This interface is used to save/restore a COM object's state to/from an IMoniker instance. Our initial plan was to create the COM object and restore its state by calling the IPersistMoniker->Load() method with a URLMoniker pointing to an HTA file. So we created a small program and run it in VisualStudio. But calling IPersistMoniker->Load() returned an error code 0x80070057. After some debugging we realized that the error code came from a call to CUrlMon::GetMarshalSizeMax(). That method is called during custom marshalling of a URLMoniker. This makes perfect sense since we called IPersistMoniker->Load() with a URLMoniker as a parameter. Since we do a method call on a remote COM object the parameters need to get (custom) marshalled and sent over RPC to the RPC endpoint of the COM server. 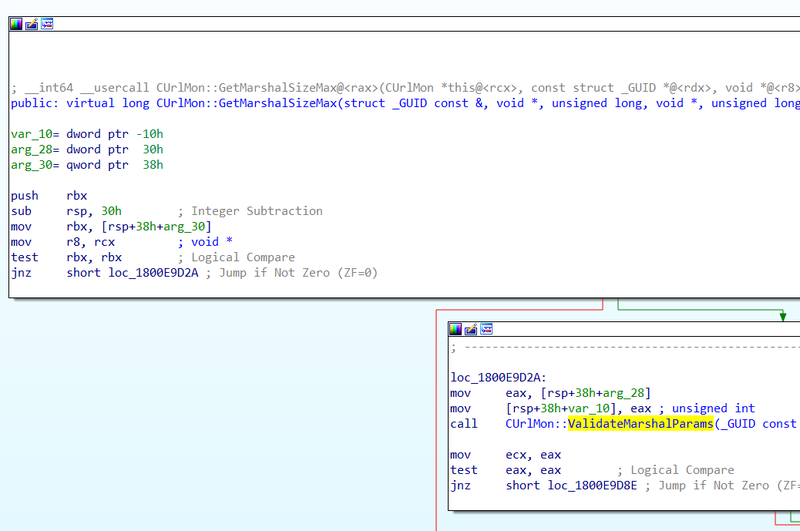 So looking at the implementation of CUrlMon::GetMarshalSizeMax() in IDA Pro we can see a call to CUrlMon::ValidateMarshalParams() at the very beginning. At the very end of this function we can find the error code set as return value of the function. Microsoft is validating the dwDestContext parameter. If the parameter is MSHCTX_DIFFERENTMACHINE (0x2) then we eventually reach the error code. As we can see from the references to CUrlMon::ValidateMarshalParams() the method is called from several functions during marshalling. In order to bypass the validation we can take the same approach as described in our last blog post: Creating a fake object. The fake object needs to implement IMarshal and IMoniker. It forwards all calls to the URLMoniker instance. To bypass the validation the implementation methods for CUrlMon::GetMarshalSizeMax, CUrlMon::GetUnmarshalClass, CUrlMon::MarshalInterface need to modify the dwDestContext parameter to MSHCTX_NOSHAREDMEM(0x1). The implementation for CUrlMon::GetMarshalSizeMax() is shown in the following code snippet. And that's all we need to bypass the validation. Of course we could also patch the code in urlmon.dll. But that would require us to call VirtualProtect() to make the page writable and modify CUrlMon::ValidateMarshalParams() to always return zero. Calling VirtualProtect() might get caught by EDR or "advanced" AV products so we wouldn't recommend it. Now we are able to call the IPersistMoniker->Load() on the remote COM object. 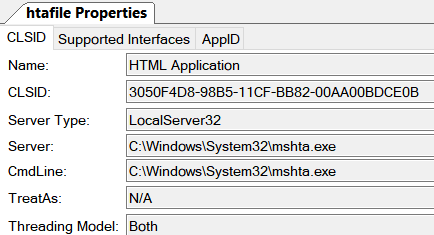 The COM object implemented in mshta.exe will load the HTA file from the URL and evaluate its content. As you already know the HTA file can contain script code such as JScript or VBScript. You can even combine our technique with James Forshaw's DotNetToJScript to run your payload directly from memory! It should be noted that the file doesn't necessarily need to have the hta file extension. Extensions such as html, txt, rtf work fine as well as no extension at all. We created implementations of our technique in C++ and C#. You can run them as standalone programms. The C++ version is more a proof-of-concept and might help you creating a reflective DLL from it. The C# version can also be loaded as an Assembly with Assembly.Load(Byte) which makes it easy to use it in a Powershell script. You can find both implementations under releases on our GitHub. The HTA PowerShell Delivery method allows to execute a PowerShell based, staged beacon on the target system. Since the PowerShell beacon is staged, the target systems need to be able to reach the HTTP(S) host and TeamServer (which are in most cases on the same system). The HTA .NET In-Memory Delivery takes the technique a step further by implementing a memory-only solution that provides far more flexibility in terms of payload delivery and stealth. Using the this option it is possible to tunnel the HTA delivery/retrieval process through the beacon and also to specify a proxy server. If the target system is not able to reach the TeamServer or any other Internet-connected system, an SMB listener can be used instead. This allows to reach systems deep inside the network by bootstrapping an SMB beacon on the target and connecting to it via named pipe from one of the internal beacons. Due to the techniques used, everything is done within the mshta.exe process without creating additional processes. The combination of two techniques, in addition to the HTA attack vector described above, is used to execute everything in-memory. Utilizing DotNetToJScript, we are able to load a small .NET class (SCLoader) that dynamically determines the processes architecture (x86 or x64) and then executes the included stageless beacon shellcode. This technique can also be re-used in other scenarios where it is not apparent which architecture is used before exploitation. For a detailed explanation of the steps involved visit our GitHub Project. To detect our technique you can watch for files inside the INetCache (%windir%\[System32 or SysWOW64]\config\systemprofile\AppData\Local\Microsoft\Windows\INetCache\IE\) folder containing "ActiveXObject". This is due to mshta.exe caching the payload file. Furthermore it can be detected by an mshta.exe process spawned by svchost.exe.